I don’t know why I put reading The Raven Boys off for so long. I had only heard good things about it. I’ve heard people rave about Maggie Stiefvater’s writing for years, but for some reason I just never got around to this. So, since it’s TBR Take Back Month, I decided it was time! And boy, am I glad I did. The Raven Boys starts off a bit slow at first. It took me a while to really figure out what was going on and the character dynamic. That could be partly due to the fact that I really didn’t like the audiobook actor’s voice. He made everyone sound gravelly and weird, because when I would switch to the Kindle Galley version and get his voice out of my head I didn’t have that problem. Once the action started picking up, however, I had no problem at all. And the ending! WOWSERS! Talk about opening things up for Book 2! I really enjoyed the characters in this book. Blue, our heroine, has grown up as the only non-psychic in a family of psychics. It was also prophesied when she was born that her kiss would kill her true love. Talk about a bummer of an existence. So she’s lived her whole life blind to her families “sight” and alone, always fearing that if she lets someone get too close she could kill him. So, Blue is searching for meaning in her life, purpose for this solitary existence she’s been born to. She wants to feel like she belongs in this family full of psychics that she really doesn’t seem to fit in. She wants to feel the magic her family takes for granted. And I think deep down she wants to feel love even though she is terrified of falling in love because of her foreseen future. Then there are the boys: Gansey, Ronan, Adam, and Noah. They have the most interesting dynamic together. Almost to the point of being one entity, The Raven Boys. Gansey basically is your stereotypical privileged “Raven Boy” except for one thing. He doesn’t want to be that stereotype. He wants to be seen as more than his money and his family. Gansey wants to make something of himself that transcend his birth and socioeconomic status. I loved this about him. His selflessness and devotion to his friends was so genuine. Ronan is dark and broody and a little bit out of control because of some of the things that have happened to him, but I want to like him so much. I hope I see more of his character in the next book. Then there’s Adam. I have a special spot in my heart for Adam. He’s a poor kid with a really tough situation who is determined to be a self-made man. He doesn’t want help. He doesn’t want Gansey to “own him” through his charity. He wants to do it on his own and a part of me really admires him for that. While I think in some ways Gansey’s attempt to escape his upbringing is a bit harder, they are both attempting the same thing for largely the same reasons. And last but not least—sweet, quiet Noah who so often seems to fade to the background yet can’t help but steal the reader’s heart. Even the secondary characters made me love this story. So much great character development and entwining of subplots. The mythology and backstory and intricacy of subplots was just so entertaining to watch unfold. I loved that the main plot of this book was resolved, but there is so much more to the overall quest and so many more questions to be answered. I love the multiple POVs/main characters. It was intriguing to get so many perspectives. Stiefvater did this in such a way that I was always kept guessing and always kept reading. Honestly, this series has all the makings of a favorites shelf series. 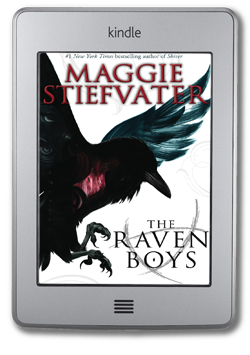 Overall, The Raven Boys was compelling, surprising, and utterly enjoyable. Totally excited to see what Maggie Stiefvater does with this story next! I loved this book! Maggie definitely has a way of drawing the reader in, and I loved all of the magic in this story. The second book is just as great, and we see a lot of the characters true colors and feelings. I cannot wait for the third installment to come out. I’m excited to see where Maggie takes us! This is a great book, I’ve heard others say the audiobook wasn’t for them, but I enjoyed the voice actor. Glad you liked this one. Dream Thieves is just as good !